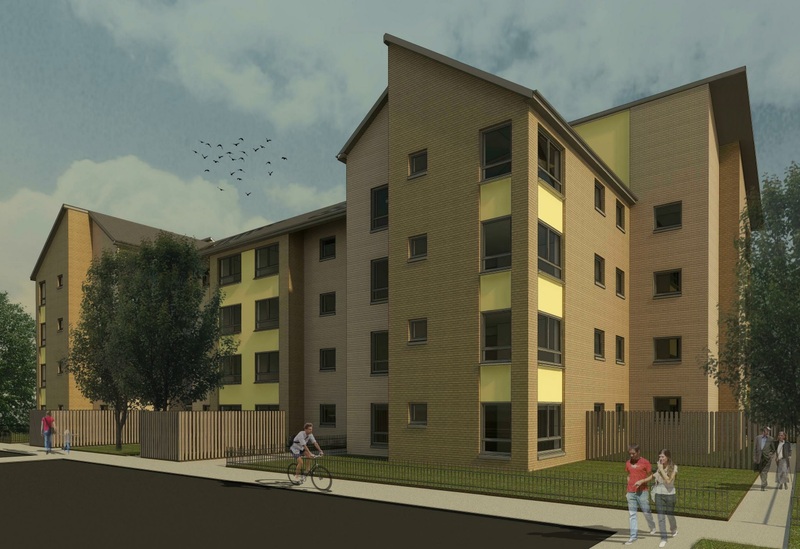 ORA are working closely with Sanctuary Housing Association on a complex £75million regeneration project, and in collaboration with North Lanarkshire Council and the Scottish Government. This project will see the demolition, and re-provision, of twelve 1960’s high rise blocks over four sites, including Hume Road, in Cumbernauld within a ten year period. Hume Road Regeneration includes the demolition of 3no. high rise blocks, making way for a new build 90no. unit flatted development. The design proposals respond to the inherent site shape & topography to create a development that embraces the design principles of Designing Places and Designing Streets to deliver new and sustainable homes for the residents of Cumbernauld. In accordance with Designing Streets’ guidance, ORA’s design emphasis has been on place making where movement and circulation considerations are accommodated as an integral part of the wider design. This balanced approach creates a rich and varied setting consisting of both hard and soft landscaping elements. The proposed blocks are typically 3 storeys in height, extending to 4 storeys at node points within the development defining the sense of place. The plan form has been articulated to maximise natural light and panoramic views for the primary living areas where practicable. These public rooms are then articulated to achieve an elevational hierarchical treatment and building massing. Phase I of the development was completed in early 2018, comprising of 24 no. flatted units, achieved a ‘Gold’ standard accreditation from Police Scotland Secured By Design. Phase II is due to commence on site in the coming weeks creating a further 66 flatted units to conclude the Hume Road Regeneration project. Completion is scheduled for early 2019.